I love the book choices btw 🙂 I would love to read Delirium! I would love to win books! I love to read, it’s a great escape! Outliers, I have read a lot of these but not that one! Pride and Prejudice by Jane Austin, a book that can be read over and over again! I read a few on your list. Room by Emma Donoghue was a real page turner and is a good one to add to your list. I want to read Divergent as I’ve heard really good things about it. I would love to read all of these books. I have read The Shack and Cold Mountain both of these books are excellent books also books I would recommend as a must read. Would like Wildflower Hill. 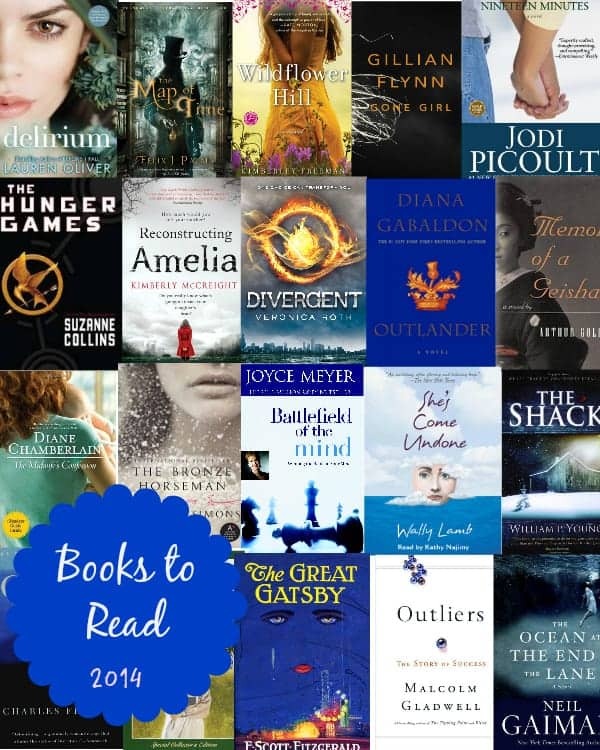 I’ve read several of the books on the list, my favorite one being The Shack. Actually read that one a couple of times. I was given a Kindle Fire for Christmas and already have it loaded with lots of books! Love to read and am always on the look out for new books. I would pick The Midwife’s Confession by Diane Chamberlain. I might choose Memoirs of a geisha. Wildflower Hill I would choose, I have read a few on this list. I have read 19 minutes, Memoirs of A Geisha, The Great Gatsby, Pride & Prejudice, She’s Come Undone, Anne of Green Gables, The Lord of the Rings. I love to read! I’m not sure which I’d pick, maybe Outliers or Reconstructing Amelia. I would choose Battlefield Of The Mind if I were to win. The Shack I here It’ll blow you away. I would really love to choose Wally Lamb’s book She’s come undone. The first book I read that jump started me on my road to reading was Mutant Message Down Under….I thought man that was interesting I wonder what other books out there are like this. It might not be for everyone but for me it started me on my journey for the love of reading. I can read and see the story unfold in my mind and in most cases would love to have the book go on forever and ever. I would let you choose for me. What is you favorite? I’ve been dying to read The Ocean at the End of the Lane! I would choose The Hunger Games.